Combine milk, eggs, maple syrup, 2 Tablespoons sugar, orange peel and salt; mix well. Pour half of mixture into each of two 9-inch square baking dishes. Dip both sides of each slice of bread in milk mixture; arrange in the same baking dish. Cover with plastic wrap and refrigerate overnight. Marinate cherries in orange juice and remaining 1 Tablespoon sugar overnight. Carefully transfer bread slices to a nonstick, buttered baking sheet using a large spatula; allow excess liquid to drip into pan used for soaking overnight. Bake in a preheated 400 degree F. oven 15 to 18 minutes; turn slices over halfway through baking time. 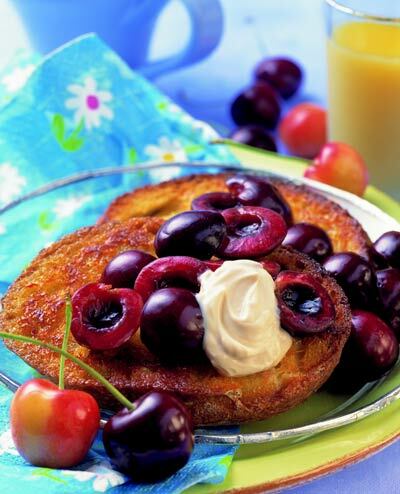 Top each slice with 1/2 cup cherries and a dollop of vanilla yogurt. Serve immediately.